The Ha Nam People’s Committee on January 10 discussed a project to build a white-rumped langur conservation area in the northern province. The white-rumped langur, scientifically named trachypithecus delacouri, is a critically endangered primate species endemic to northern Vietnam. It is considered to be one of the world's most endangered primate species. The conservation site will cover some 2,483ha in Lien Son and Thanh Son communes of Kim Bang district. The region has high biodiversity value and it is large enough to develop a population of white-rumped langur. According to a survey by Fauna & Flora International (FFI) in 2018, the forest area in Kim Bang district has 13 flocks of white-rumped langurs, made up of 73 individuals. 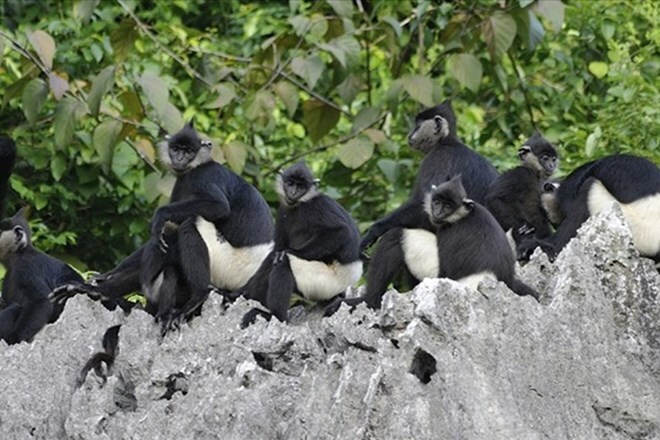 However, the white-rumped langurs in Kim Bang in particular are under serious threat from hunting and habitat loss due to mineral exploitation and forest product collection. Vice Chairman of the provincial People’s Committee Truong Minh Hien said the building of the conservation area is in line with the locality’s policy to develop the economy in association with environmental protection and sustainable development. The Ha Nam People’s Committee assigned the provincial Department of Agriculture and Rural Development to coordinate with the FFI to complete the project. The Department of Construction and the Department of Natural Resources and Environment were requested to stop businesses that are carrying out activities affecting the conservation area.